Timesoftware is an online retailer of software, such as Windows 8, Visio Pro, and Project 2013. Their mission is to provide a complete solution for organizations to ensure that they get the right software on time. We make sure that every dollar spent is a dollar well invested. We provide only download versions of the software that you buy from us. The license will be sent via email. It doesn’t matter whether you buy a Windows 8 copy or a Project 2013, we will provide a way for you to download the software and you will get the license within two hours after the transaction has been completed. Our products and services are ideal for people who are looking for a way to purchase additional product keys so that they can install Visio Pro or any other software on another PC at home. They don’t need the physical DVD in order to install the program. Plus, we provide a download link so that buyers can get the installer for the OS or software. The prices for Window 8, Visio, and Project 2013 are much lower compared to a retail store because we buy keys in bulk that allows us to pass along the savings to our customers. When you purchase the same product in a retail store, you are buying a copy of the software as well as the packaging that comes with it. We also provide convenience by allowing clients to buy the Microsoft products from the comforts of their homes. We accept PayPal and major credit cards for payments. There’s no need to stand in line or deal with crowds. When you choose to buy Windows OS, Visio Pro or any other software from Time Software, you are guaranteed to receive legitimate software from Microsoft. We don’t sell bootleg software, and we ensure that all the keys we send are working. 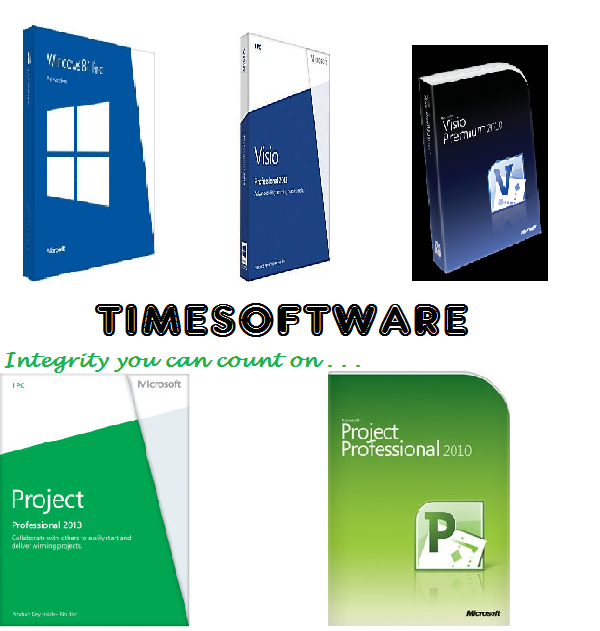 Time Software provides genuine Microsoft products at very affordable prices. The next time you need to purchase Windows 8, Project 2013, or Visio, you should check our prices first. We offer competitive prices on all the software we sell on the site. Type:32bit and 64 bit . Type: 32bit and 64 bit . What next, After Creating A Blog?